Cameron Redfern is a member of the Temple Law Class of 2019. Editors Note: Since Philadelphia is known as a city of neighborhoods, we asked Temple Law students, faculty, and staff to talk about what they love, hate, and can’t live without in their neighborhood. See all of the neighborhoods covered thus far. If you are looking for small neighborhood charm, just over one mile from Center City and a 15-minute bike ride from Temple, Fairmount is the Philadelphia neighborhood for you. Choosing to live in Fairmount during my time in law school has been one the best decisions I have made. Fairmount is a tight knit community, with all of the best aspects of living in small neighborhood. There is a mix of apartment and row house living options all at a reasonable cost and free street parking. For the past two years, I have lived in a row home on a quiet Fairmount side street. My home on N. Stillman Street features three bedrooms, one full bathroom, a spacious kitchen, living area, back patio, and laundry in the basement. I live with two roommates; together we pay $1,750 a month in rent, which is $580 individually. N. Stillman Street is home to various families who have lived on the street for the past 30 years, as well as more recent additions including my neighbor who plays the violin in the Philadelphia Philharmonic Orchestra, and many others. Throughout the seasons neighbors change their beautiful decorations and plants surrounding their homes, including the additions of fake spider webs and witch décor during Halloween, and holiday lights in the winter. My house is a three-minute walk from two different coffee shops, a dry cleaner, a local pharmacy – Ellis on Brown Street. All of these business owners make it a point to remember your name and maintain ongoing conversations about school, weekend plans, and have plenty of neighborhood intel. There are also many unique restaurants, often BYOB, lining the surrounding streets. Food options include sushi, Mexican, Italian, Greek, Middle Eastern, and of course pizza. Best thing: The small community feel, recreational space, and the restaurants. The best aspect of living in Fairmount is the small community feel. I spend many evenings, particularly in the fall, taking walks throughout the streets and I find myself smiling and waving to many neighbors whom I have come to know. Eating dinner at my favorite restaurants, where the owners and staff know who I am, makes me feel like I have escaped the intensity of Center City. Fairmount is also well situated in relationship to Center City and Temple Law. Fairmount is one and a half miles from Center City and many bus routes are easily accessible. My preferred mode of transportation to school is bike. A bike ride from my house to Temple takes roughly 12 minutes. The Girard Trolley is also an accessible form of public transportation from Fairmount to Temple. The endless and affordable food options in Fairmount are enough to keep any law student well fed. In addition to the countless restaurants described above, Fairmount is also home to a Whole Foods, and is a short distance from Trader Joe’s. Throughout the Summer, on Thursday evenings from mid-May to mid-September, Fairmount hosts a farmer’s market with endless fruit and vegetable options from local farmers. There are countless attractions located in Fairmount. The most prominent of these attractions is the Philadelphia Art Museum, which is currently a seven-minute walk from my door. The Art Museum is one of Philadelphia’s most notable attractions and sits on the Benjamin Franklin Parkway. The Parkway is host to Philadelphia’s largest outdoor events including, many marathons, the Made in America Festival, and recently the 2017 NFL Draft. 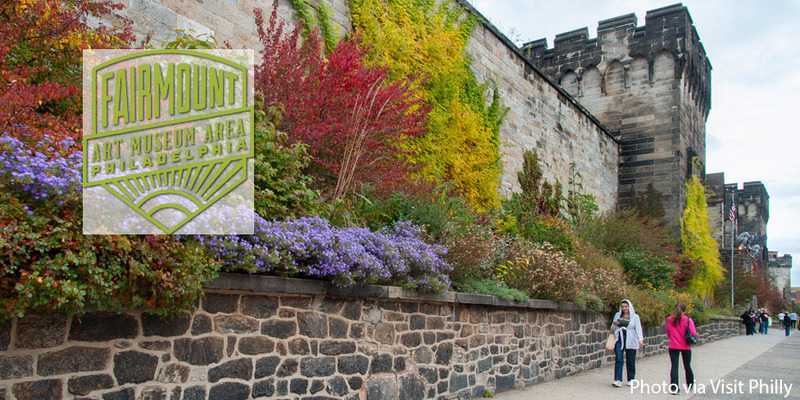 Fairmount is also home to the historic Eastern State Penitentiary which once housed Al Capone. Now, the Penitentiary is a frequent stop for Halloween fans hoping to be spooked and history buffs yearning to see inside the walls. Fairmount is a particularly great spot for runners, bikers, and lovers of the outdoors. The Schuylkill River Trail, 10-mile trail along the river which provides beautiful recreational space, is a frequent destination for exercise enthusiasts throughout Philadelphia. Furthermore, Fairmount Park is a short distance from the neighbor and includes 9,200 acres of trails, woodlands, and wetlands great for summer picnics. Finally, Fairmount Avenue, the heart of the neighborhood, is my absolute favorite aspect of my neighborhood. The street has businesses including, pet shops, used book shops, art studios, boutique clothing stores, plant and hardware stores, and many others. Many of my Saturday mornings are spent strolling Fairmount Avenue with a cup of coffee and popping in and out of these shops. There are very few drawbacks to living in Fairmount. It is fairly separate from Center City which may require that you meet many of your law school friends closer to downtown. Fairmount is also best suited for those willing to live with roommates due to the amount of three and four bedroom options in the area. With all that in mind, Fairmount is an affordable, fun, and friendly community that is a wonderful home for any law student. Previous PostHow Do I Reflect the Best “Me” to My Students?